Place the potatoes into a large pot, and cover with salted water. Bring to a boil, reduce heat to medium-low, cover, and simmer until tender, 20 to 25 minutes. Drain, and return the potatoes to the pot. Turn heat to high, and allow the potatoes to dry for about 30 seconds. Turn off the heat. 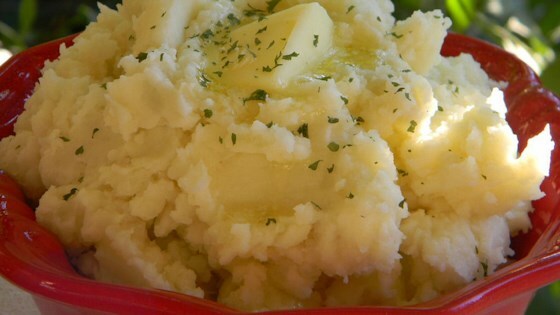 Mash the potatoes with a potato masher twice around the pot, then add the butter and milk. Continue to mash until smooth and fluffy. Whisk in the salt and black pepper until evenly distributed, about 15 seconds.